This flashlight fits well on my Glock 21. I’ve tried different weapon lights on the market but they haven’t provided me with the results I was looking for. Some don’t fit well on the rail, while others are not very effective. A friend of mine recommended the streamlight tlr 1 light which I have come to love and use it regularly. Thus, I am going to write streamlight TLR 1 review here. Before I started using weapon lights, I was using a tactical torch which was very difficult to balance when shooting. Also, using a tactical light can cause you to miss your target or to delay when switching it on. The Streamlight tlr 1 flashlight is easy to use with the ambidextrous switch. In addition, it offers very bright light with its 800 max lumen. This means that you will view the person in the dark or your target very clearly. You can also compare this weapon light with streamlight tlr 6, tlr 4 and tlr 3. Another thing that I like about this streamlight tlr 1 light is that it is sturdily built from aircraft aluminum with anodized finish. Also, it has a shock mounted glass lens that protects the LED bulb from being damaged. The C4 Led bulb provides 12, 000 candela peak beam intensity. In addition, setting up the flashlight on the rail clamp system is simple with no tools and without putting your hands in front of the muzzle. The streamlight tlr 1 light is also powered by 2 3-volt CR123 lithium batteries with a 10 year storage life. The batteries are included on purchase. Furthermore, the manufacturer offers a lifetime limited warranty to buyers of the flashlight. Streamlight is a wonderful brand with various quality flashlights on the market. Flashlights made by streamlight are high performing and durably built. Most of these lights can function in extreme weather conditions such as in the scorching sun, freezing cold, in dusty conditions or even in snow. Whatever the conditions, streamlight flashlights are built to excel and offer outstanding outcomes. The streamlight tlr 1 led light is well constructed to withstand the harsh surrounding and serve the user for a very long period of time. It is made of a sturdy aluminum construction with anodized finish. The glass lens can defy high temperature, shock, and is resistant to impact, too. Such features make this flashlight to be reliable in different weather conditions and terrains. The torch can be used in the woods, rocky terrain, and in extreme cold environments without fear of failure. LED bulbs are the best. They are long lasting and can as well defy impact and other stress that causes bulbs to shutter. The C4 LED that the streamlight tlr 1 has is able to offer consistent bright light of up to 50, 000 hours. In addition, the engineered optic forms a concentrated beam with optimum peripheral illumination. Also, C4 LED bulb utilizes little energy when compared to other kinds of bulbs. If you are worried on how to use this weapon light, then you should be. It has an ambidextrous momentary/steady on-off switching. This allows you to change to the type of light that you need. You can as well set the torch to momentary on for temporary light or steady on for longer use. Furthermore, it has user programmable strobe that can be enabled or disabled. The strobe mode is usually used to disorient enemies. The light can as well be operated with a one hand snap-on and tightening of interface to keep the hand away from muzzle when attaching or detaching the light. The handgun flashlight will operate for some hours before running out. It has a run time of 1.25 hours. It is powered by two 3-volt CR123A lithium batteries. These are usually included in the purchase. In addition, it has tethered battery door and latch mechanisms that prevent battery door loss replacing the battery. It is a good idea to have spare batteries if you will be out for longer hours. One of the things that outdoor enthusiasts are afraid of is bad weather. Many flashlights made on the market are not able to deliver great outcomes in extreme weather conditions. The streamlight tlr 1 is a wonderful light that continues to function well in poor weather such as rain and snow. It is IPX7 waterproof to one meter for 30 minutes. Also, it can operate in temperatures of between -40 to +120 degree Fahrenheit. There are some weapon flashlights that are heavy and a burden to install on your Glock 21 or any other type of gun. 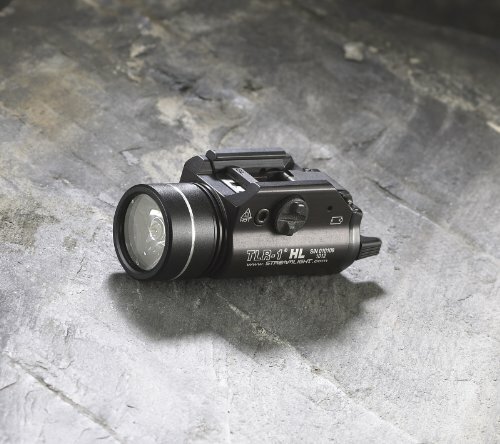 But with the streamlight tlr 1 light, you won’t feel the weight as it only weighs 4.18 ounces. 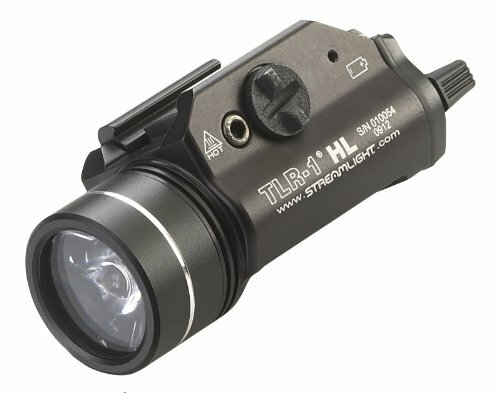 If you have been looking for a very bright light to ensure that you see your target clearly, then the streamlight tlr 1 light is the most ideal flashlight to have. It has a maximum of 800 lumens, 15, 000 candela, and 245 meter beam. The torch will properly light your room and path. This tlr 1 light can be used different types of guns. It comes with keys for Picatinny, S&W 99, Glock style, Baretta 90two, and S&W TSW. As a matter of fact, it can be mounted directly on handguns with Glock-style rails and MIL-STD-1913 rails. Since its inception, streamlight has been one of the top flashlight brands on the market. Actually, when you search for flashlights on Amazon, Google, and other sites, you will notice that the streamlight brand will always appear. The brand offers different types of lights for different people. There are tactical lights, weapon lights, every day carry lights, work lights, and many others. The lights built by streamlight come with excellent features and have been accepted by many light users in the market. Streamlight flashlights are made in the USA and meet the quality standards. Also, they meet the applicable European Community directives. The streamlight tlr 1 weapon light is a feature packed and durable flashlight. It is able to fit on different types of guns with keys such as glock, beretta, and Smith & Wesson. The flashlight is constructed from durable materials and it can resist adverse weather conditions. Moreover, the flashlight is very bright with max of 800 lumens and setting it up on the rail clamp system is very easy. After finding out about the quality and efficiency of the streamlight tlr 1 flashlight, I decided to share this with other Glock or handgun users. People usually land bad weapon lights because they don’t know the different lights available. I will continue using the streamlight tlr 1 flashlight and recommend you to-do-so. Try it out and observe the difference with other weapon lights. 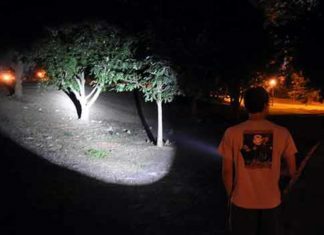 Still, have a question after reading this Streamlight TLR 1 Review? Comment below.